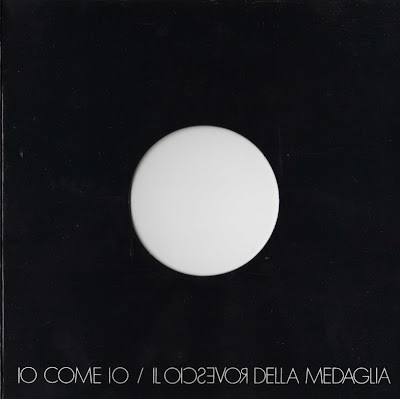 Il Rovescio della Medaglia was formed in Rome around the end of 1970 when three musicians from the 60's band I Lombrichi recruited the singer Pino Ballarini, who had moved to Rome from Pescara. Their first great success was at Viareggio Pop festival and they soon became one of the most popular live bands in Italy during the early 70's. The second one, Io come io a year later, was in the same style, with ambitious philosophical lyrics inspired from Hegel works. A short album (less than 30 minutes) but again a really good one! In 1973 a fifth member was added, keyboard player Franco Di Sabbatino, also from Pescara, like Pino Ballarini, and briefly with Il Paese dei Balocchi. With their sound enriched by the keyboards, Il Rovescio released the third album, Contaminazione, with the help of argentine composer Luis Enriquez Bacalov, who had already worked with New Trolls for their Concerto Grosso and Osanna. The album was obviously more in a symphonic direction, and was also released in an english-sung version and issued in many foreign countries, to try to launch the group abroad. The english language album appeared in Italy in 1975 only, when the band had already split up. By this time the band was being renowned for their powerful performances, always played at the loudest possible volume and helped by a unique sound system. This is what the Contamination LP liner notes said about it (originally written in english, mistakes and all...): "Their instrumentation is among the moste interesting in Europe. The 6000 watt Mack vocal equipment is quadrophonic and is equivalent to 36 track amplifiers. The console table is really a portable recording studio with filters, compressors, etc. The guitar, the battery and the keyboards have 900 watt amplifiers. The keyboards consist of a vertical B Hammond organ, a harmonium, an eminent for the reproduction of strings, two VCS synthesizers, a 200 Harp [it was probably an ARP], and two mini moog synthesizers. The lighting equipment is also important. There are 50 spotlights which produce colors and special effects. On a special screen behind the group, slides and films are projected to produce abstract musical effects.". Not bad for an italian band, and no one else in Italy had such a powerful live act! But... in december 1973 the stealing of their big and expensive PA brought the band close to the end, with Pino Ballarini leaving for Switzerland (briefly replaced by Michele Zarrillo from Semiramis) and the others continuing as an instrumental-only band. The live album Giudizio avrai, privately released by the band in the late 80's, contains a recording from this period, with the band's sound dominated by the keyboards. Last release is a single from 1975 (there's a mention on its cover of a new album, but this was never released), then the band had various line-up changes up to 1977. Bassist Stefano Urso founded Europe, authors in the early 80's of an album (Bubble BLU-19609) and some singles in pop/rock style. In early 90's guitarist Enzo Vita reformed the band with a new line-up and released a new CD called Il ritorno, different from their past production and more AOR-inspired, as its follower Vitae (recorded earlier). muchas gracias por este album.